Here’s everything you need to know for this month’s ride! 1) Remember we moved the ride time! Meet at 6:30 roll out at 7pm! 2) Here is the route! Be sure to look it over and print out a cue sheet just in case! 3) If the police are there, we can ride as one mass. If not, we all have to abide by the red light policy (as described in detail on this page) be prepared for either option this month! 5) This month we are ending at the Lexington Market lot. As usual there will be beer, wine, dancing, and the photo booth! Along with that we have TONS of vendors from the market ready to fill your bellies! 8) Remember to bring your lock and review how to lock your bike up! There is fencing around the entire lot and there will be security on the lot, but don’t lose your bike or your accessories by leaving them unsecured! 2) The afterparty has a pretty strong shut-down time of about 11pm, but if you want to keep the night going, feel free mosey on down to Alewife Baltimore a block south or Pratt Street Ale House 3 blocks down and 1 block east! If you decide to go out after bike party, TAKE YOUR BIKE WITH YOU. Bikes left in the parking lot MAY HAVE TO BE REMOVED if they are still there in the morning as the market opens early for business! 3) We are going to add something new this month! 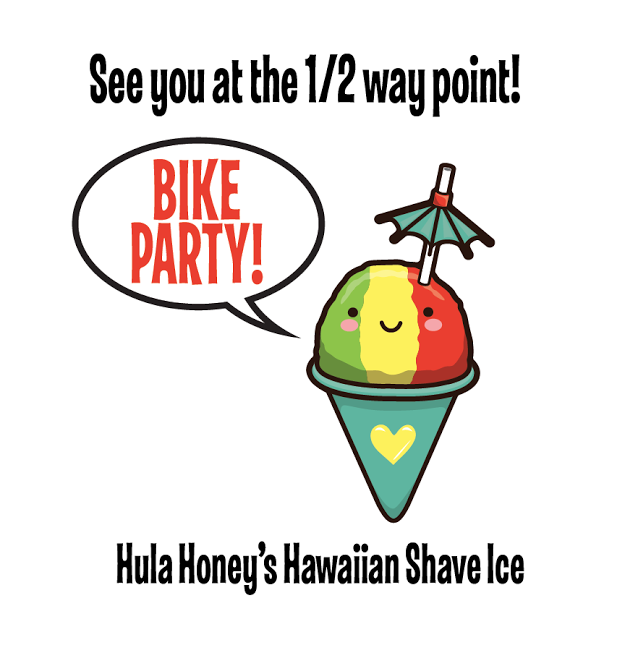 Hula Honeys will be selling Hawaiian Shaved Ice at the rest stop! If this is a success we will bring them back repeatedly for the rest of the summer!